Did you know surveys show that most consumers at the grocery store buy the same 130 or so products over and over? Think about the last week or two. How many new foods have you tried? Maybe you tried a new recipe or one of the different types of whole grains that are available, like quinoa or teff? Or, maybe you tried a fruit or vegetable you had never tried before? What about different types of physical activity? When was the last time you switched things up and did something completely different? Maybe you are adventurous and have tried some new things recently, but for many of us it is all too easy to get in an exercise and eating rut. Most of us are creatures of habit and because of that adding variety to our lifestyle can be challenging and a little scary at times. For this week, let’s focus on the importance of getting variety in the foods we eat. I will follow-up next week and talk about exercise and the critical importance of mixing it up…often. Getting variety in the foods you eat is key to a healthy diet and prevention of chronic disease like cancer, diabetes, and heart disease. Different types of whole food provide different nutrients. They each have vitamins, minerals, phytochemicals, and antioxidants that are important for disease prevention and making our bodies well. If you are always eating the same food choices and never branching out to try new things then you are not getting the benefits of varied nutrients and your diet can become repetitious and mundane. The beauty of whole foods is that each one provides a different combination of healthy, disease-fighting nutrients and by including a variety of foods you ensure that your body has what it needs to function to the best of its ability. Try keeping a variety of foods around to give yourself the gift of choice. Stock your pantry and refrigerator with healthy selections of whole grain pastas, many different colors of fruits and vegetables, beans, and nuts. Give yourself a goal of trying one new food each week, whether it is one of the many whole grain options that are available or a new fruit or vegetable – or one you haven’t eaten in a while. Aiming for 8-10 servings of fruits and vegetables gives you plenty of opportunity to get in lots of variety throughout the day. It’s easier than you think. What is a serving? A serving of fruit is equal to a small piece of fruit, 1/4 cup dried fruit, 1/2 cup fresh, canned or frozen fruit, or 4 oz. of juice. 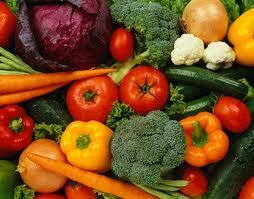 A serving of vegetables is 1/2 cup chopped or cooked vegetables, 1 cup leafy greens, or 6 oz. vegetable juice. With Summer fast approaching, now is the perfect time to enjoy nature’s bounty of fresh fruits and vegetables in a rainbow of colors. The most important thing is to mix it up and make food fun. Branch out. Try something new! The more you do, the more health benefits you will reap. Stay tuned! Next week I will focus on variety in exercise and why it’s important.